First of all, I felt like it’s time to start using anti-aging product or anything that could enhance the moisture and youth of my skin because I am hitting the sacred age of 30 this year. Earlier, I have tried SK-II Facial Treatment Essence and Radical New Age once. I am sure you know how famous that brand for anti-aging product. And it did actually work! Maybe the only thing I concerned about that brand is the price 😀 So I am looking for similar product with similar result for less price. And third reason, I was encouraged to try this product because of some recommendation I got from people close to me. I saw this product for the first time when my sister used it. She is 28 years old. I asked her, and she said it was great. I know she knew exactly what she was talking about because she is good in taking care of her skin. And when I talked about this product at my office, it turned out that my boss (35 years old) and her mother (about 60 years old) wore it too. So ALL AGES CAN WEAR IT. Have you often found some brands which has specific line of products; cream A for the 20s, cream B for 30s, cream C for 50s and above? Well, NUTRIGANICS DROPS OF YOUTH™ CONCENTRATE is suitable to wear from your 20s to your 50s continuously. 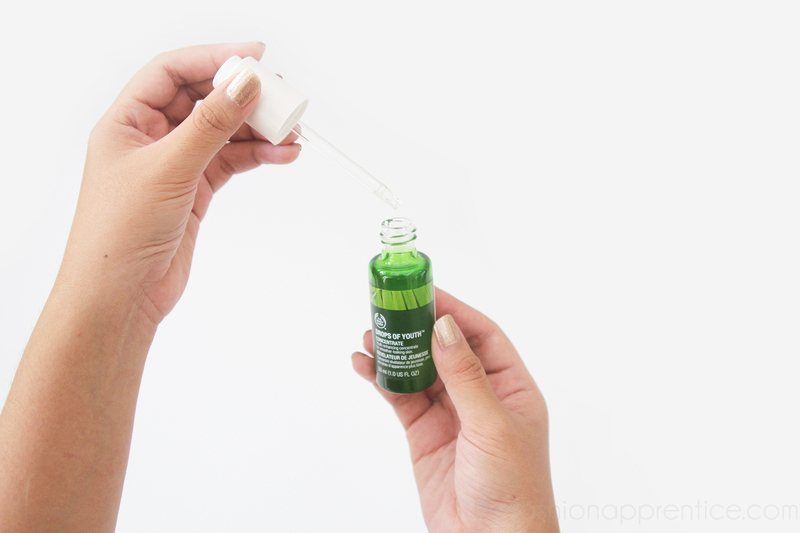 NUTRIGANICS DROPS OF YOUTH™ CONCENTRATE is an innovative concentrate or serum to help enhancing skin condition, leaving it looking smoother, fresher, and healthier. 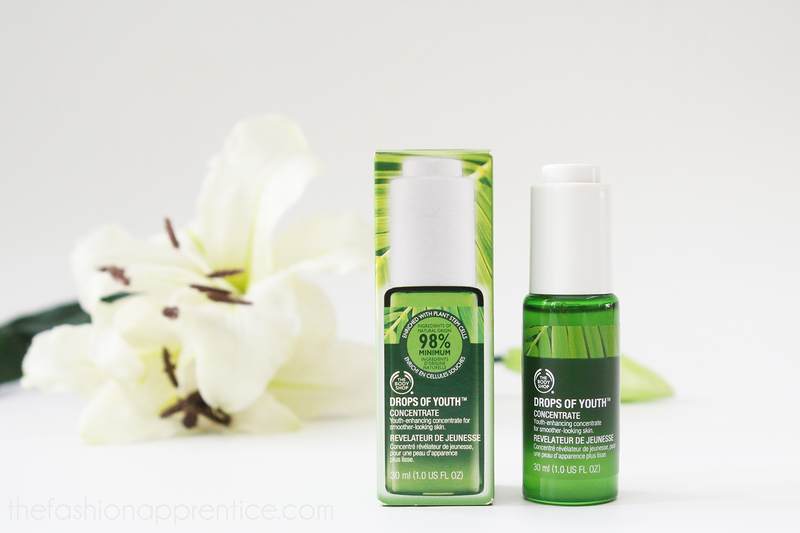 According to The Body Shop’s official website, the making of this concentrate was based on technology from plant stem cells from Criste Marine and Beech Bud extract. 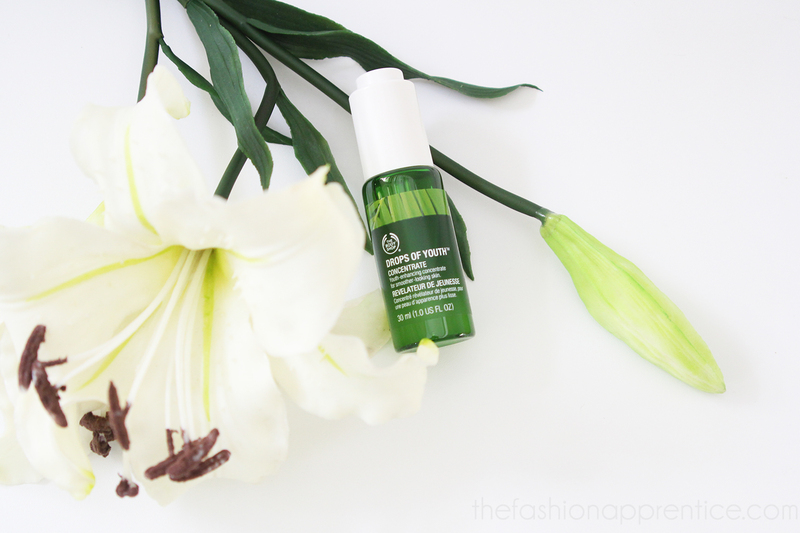 This serum is perfect for anyone looking for a treatment product to improve a skincare regime. It moistures and regenerates skin cells. So it takes daily and routine usage to get the best result. So I love the ingredients and the benefits, but can it be even better? Yes! I love the almost-liquid gel texture! Really easy to wear, adsorbs quickly, non-sticky, and definitely comfortable to wear even before you apply heavy make up. Use the pipet, have 2-3 drops on your fingertip, rub and apply on your face thoroughly. Wait for less than a minute, you can feel it adsorbs quickly. After that apply moisturizer/day cream + sunscreen/night cream. And then make up, if you were about to go out. It can be used often in a day; every time after shower or after you wash your face, and definitely before you sleep. After 2 weeks, I definitely feel the improvement. My skin is getting better and smoother. If you are the kind of girl who gives special attention to skincare and really care about facial skincare, you will get the benefit of skin maintenance and improvement. 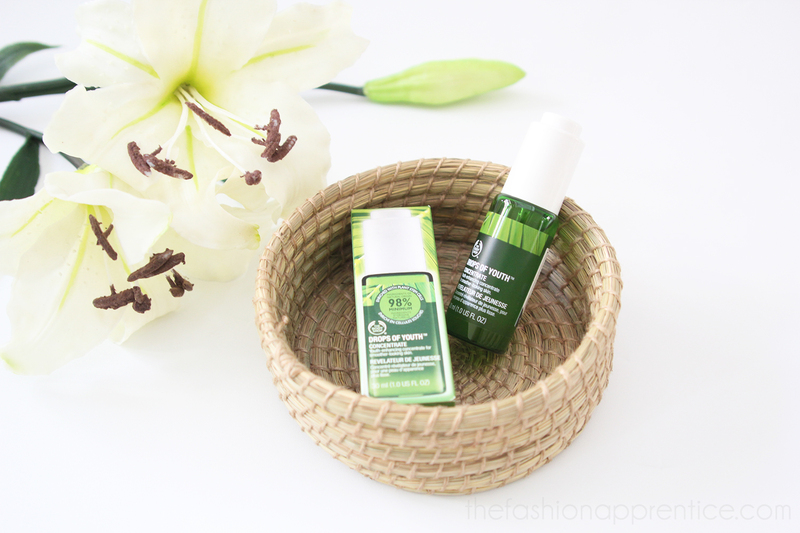 But if you are a girl like me –who never care about facial serum before, and too lazy for night creams- this serum can really do some FIXING. After using NUTRIGANICS DROPS OF YOUTH™ CONCENTRATE, it is getting better. I can really see the difference; from rough damaged skin to smoother, more elastic, moister skin after a week. I use it every morning with day cream + sunscreen and every night with night cream. I truly recommend this serum for you, who wants to start using anti-aging products. For a starter, choose the 50ml bottle. Even though it is the smallest one, it will last up to 2 months for daily use. The glass bottle is slim and sleek, still suitable for travelling. I don’t recommend replacing it into smaller travel container, hygienically speaking. You have to be patient to see the result. 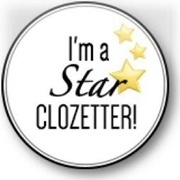 Always remember to wear it every day. From my experience, in just a week of daily wear, the result should show significantly. Oh, and what makes it work better, is because I use NUTRIGANICS DROPS OF YOUTH™ CONCENTRATE along with OILS OF LIFE™ INTENSELY REVITALIZING GEL CREAM which I bought at the same time with this serum. 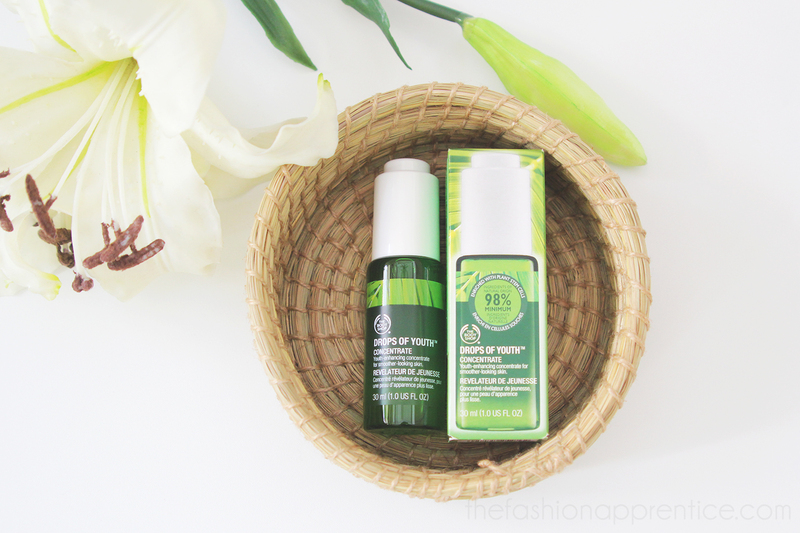 OILS OF LIFE™ INTENSELY REVITALIZING GEL CREAM, a newest skincare release from The Body Shop, is also really great as a night cream. It smells great, the texture also adsorbs quickly, and it is made of 3 precious oils. It works so well even my male friends use it too to maintain their skin’s moisture. 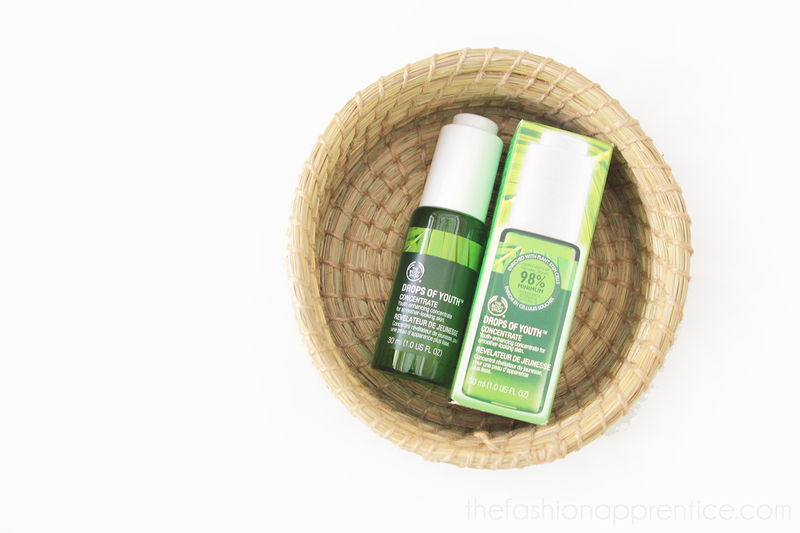 The complete review of OILS OF LIFE™ INTENSELY REVITALIZING GEL CREAM can be read REALLY SOON. 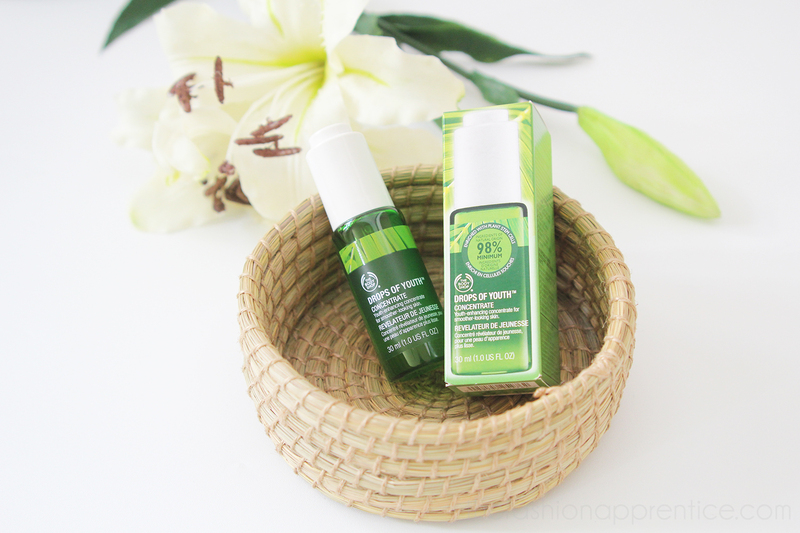 This entry was posted in BEAUTY, Reviews and tagged beauty review, beauty serum review, make up review, nutriganics drops of youth concentrate, skincare review, the body shop, The body shop beauty review, the body shop review Indonesia. Bookmark the permalink.